Shivaji Bhonsale was born on April 10, 1627 at the fort of Shivneri in Maharashtra, Western India. He was the son of Shahji Bonsale, a military officer in the state of Ahmadnagar, Decan and Bijapur. His mother, Jijabai, was an extremely religious woman. Shivaji grew up at Poona under the strict supervision of his mother and his teacher, Dadaji Konda-dev. He was made an administrator and an expert soldier by Dedaji Konda-dev. As a young boy, Shivaji was patriotic and showed the qualities of a warrior. The fall of the Bijapur and Ahmednagar empires intensified his territorial ambitions. He began to occupy hill forts near Poona, against the advice of his teacher. When Kond Dev died in 1647, Shivaji got the opportunity to turn his ambitions into actions. Shivaji started his career by gathering bands of the hardy peasantry known as the Mavales and launching guerrilla wars against the Bijapur kingdom. At the age of 16, he captured the Torna fort of Bijapur Empire. Soon afterwards he constructed new forts such as Pratapgarh and Raigarh. When the Suktan of Bijapur saw this, he was alarmed and detained Shavji’s father. 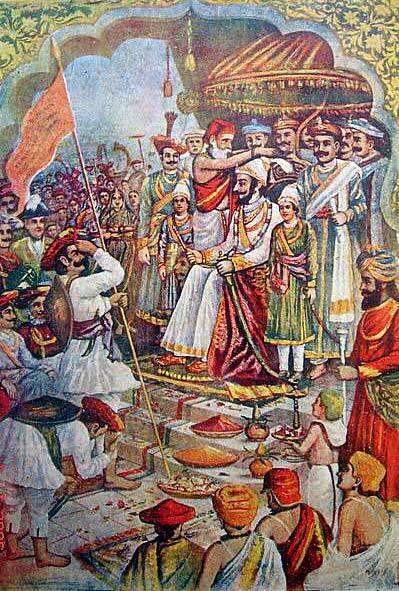 Shivaji secured his father’s freedom by suspending his military operations and surrendering Kondana to Asil Shah. In 1665, Shivaji resumed his offensive operations. In January of 1656 Javli came under his leadership which allowed him to easily expand his territory in the south and west. He also began raiding the territory of Bijapur. Shivaji constructed a strategic fort at Pratapghad and his strength increased in Konkan. His army raided the Portuguese settlement in Daman near Kalyan and captured a large treasure. The strength of Shivaji created fear in the Sultan of Bijapur and he began to look for ways to capture Shivaji. He appointed Afzal Khan for this task. Khan claimed that he would seize Shivaji. When he arrived at Pratapghad, Shivaji came down from the fort with two guards. Khan came with two of his guards as well. Khan feigned fondness for Shivaji, and attempted to stab him while hugging him. However, the assassination attempt failed and Shivaji killed Khan with a weapon known as a Baghnakh. 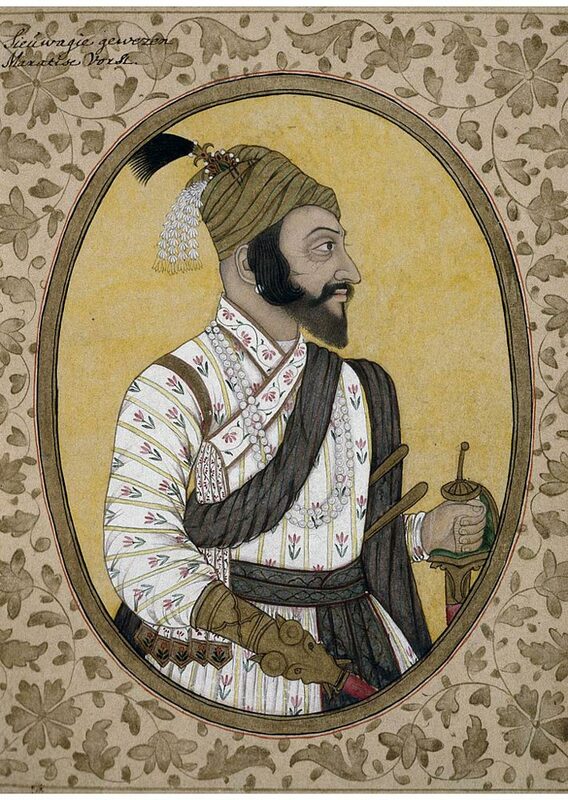 After Khan’s death, Shivaji occupied a large area stretching up to the fort at Panhala. In 1662, the Sultan of Bijapur made peace with Shivaji and acknowledged him as an independent ruler of all the territories he had managed to conquer. Shivaji entered the preeminent port city of Surat on the western coast after this victory. The city’s Mughal Governor sent an envoy to Shivaji to negotiate, but Shivaji apprehended the envoy and burgled Surat for 4 consecutive days. 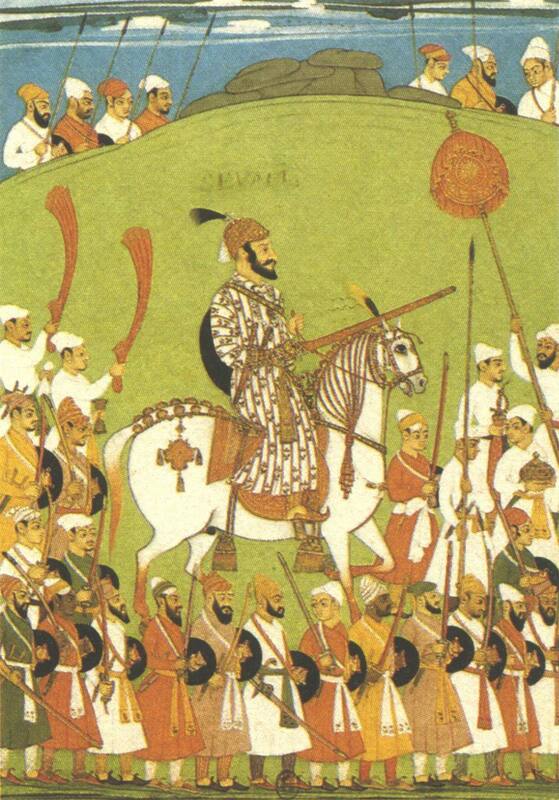 This sparked retaliation from the Aurangzeb in the form of a huge army led by the Jai Singh. Realizing that defeat was inevitable, Shivaji signed the Treaty of Purandhar in June of 1665. As per the terms of this treaty, Shivaji agreed to surrender 23 territories to the Mughals. He also acknowledged the sovereignty of the kingdom. In May of 1666, Shivaji visited the Mughal court and felt that he was treated unfairly. He became impatient and abased with Aurangzeb. Shivaji was detained and thrown in prison. However, not long afterwards, he escaped from prison and returned to Raighad. From 1667 to 1669, he remained silent and did not get involved in any military campaigns, honoring the terms of Treaty of Purandhar. He used these years to regroup and strategize. In 1670, Shivaji renewed his military operations with the second sack of the Surat. During the next 4 years Shivaji advanced his strength in the western coastal lands as well as the south. After his coronation as king, Shivaji did not stop his military exploits. He raided Karnataka and occupied Kurnool, Vellore, and Jinji. The Maratha army rapidly advanced in the Cuddalore and Shivaji named his empire “Swaraj.” Swaraj expanded from the town of Purandhar in the north to Gangavati River in the south. Shivaji also captured many different areas in the Poona District including the whole of Satara, a large area of Kolhapur, as well as parts of Mysore in the Arcot District. All these were absorbed by the Swaraj Empire. The later years of Shivaji’s life were frustrating because of his eldest son’s behavior. Unable to control him, Shivaji restricted his son to Panhala. However, the prince fled with his wife and defected to the Moguls for one year. When he returned home, unremorseful, he was re-confined to Panhala. In 1680, Shivaji fell ill and died at the age of 52 on the eve of Hanuman Jayanti in the Raigad fort. Rumors followed his death, with some Marathas saying that his wife had poisoned him. 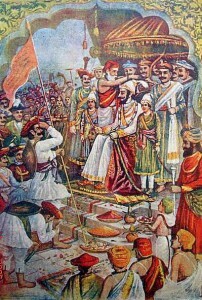 King Shivaji was succeeded by His elder son Sambhaji. During his time, Shivaji was not just a warrior as many described him but was a visionary man as well. He liberated the Hindus from the Moguls and formed a government that was inspired by principles of unity, peace, justice, as well as independence. His charm united the people of Marathas, and in his administrative arrangements, King Shivaji showed unusual wisdom. He appreciated the growing significance of naval power in the politics of the 17th-century in India. He started to create his own navy, one of the few leaders in India to do so. His significance in the history of Indian culture still exists today, as many revere him as a hero of freedom and independence.